To prove that there was life after Carol Vorderman, Channel 4’s Countdown took on a new letters-and-numbers person, Rachel Riley, as a replacement. Ms Riley has done the showbiz rounds since her first appearance on the show in 2009, including becoming another casualty of The Curse Of Strictly. But her social media profile was not a thing of controversy - until she decided to wade into the political arena. 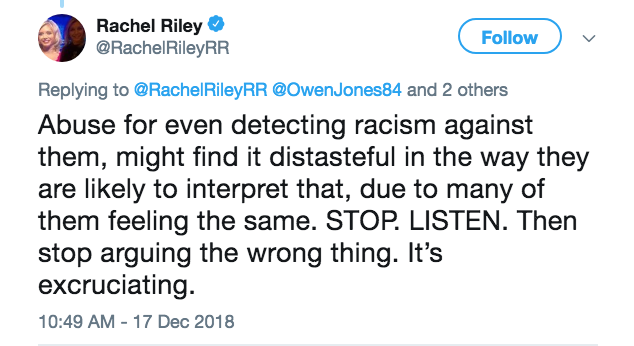 Ms Riley has become embroiled in the debate over anti-Semitism, and how prevalent it is in the Labour Party. Many others have done so; it is not an exceptional stance to be thus concerned. But it was when Alan Sugar declared that if Jeremy Corbyn won the next General Election, he would leave the country, that she made her fateful move. 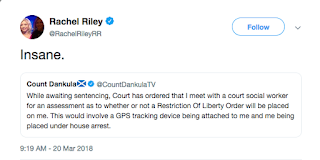 After Owen Jones had commented “In fact his specific reason for saying he’d leave the country Phil Collins style was that Corbyn would trash the economy - he said it’d be like watching your mum in law drive your Ferrari off a cliff” in response to those suggesting that the departure was because Sugar is Jewish, Ms Riley went in with both feet. “OMG. You’ve still not got it. I couldn’t give a monkey’s about Sugar’s words at this point. Saying he would leave for fears of his (probably yet unborn) great grandchildren implies it’s not financial. And my original complaint was that a MINORITY GROUP under intense scrutiny and abuse for even detecting racism against them, might find it distasteful in the way they are likely to interpret that, due to many of them feeling the same. STOP. LISTEN. Then stop arguing the wrong thing. It’s excruciating”. Many responded negatively to her intervention. 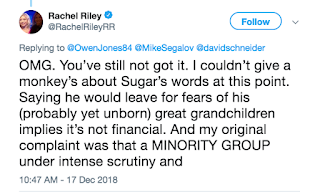 Worse, some noticed that, on this subject, Ms Riley was - perhaps inadvertently - standing in an awfully draughty glasshouse. 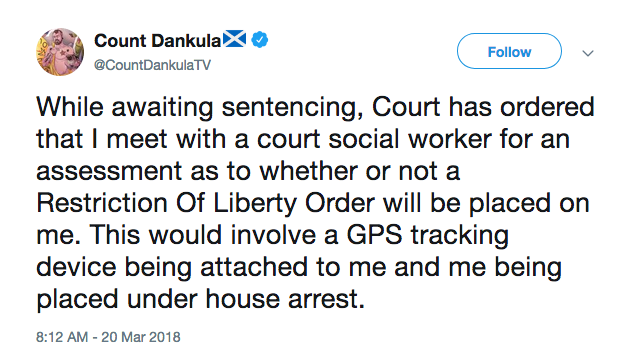 Because when Mark Meechan, who styles himself Count Dankula, told his followers “While awaiting sentencing, Court has ordered that I meet with a court social worker for an assessment as to whether or not a Restriction Of Liberty Order will be placed on me. 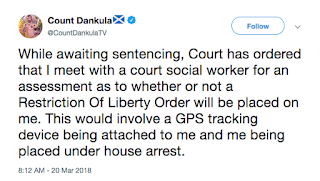 This would involve a GPS tracking device being attached to me and me being placed under house arrest”, she had responded with a sympathetic “Insane”. 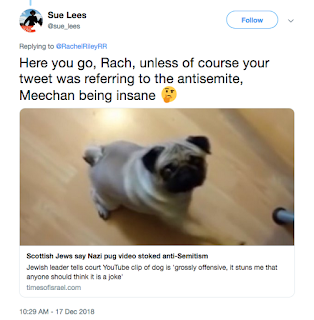 Mark Meechan found himself in that pre-sentencing state after it had been shown he had trained his partner’s dog to make a Nazi salute whenever he shouted “Gas the Jews”. 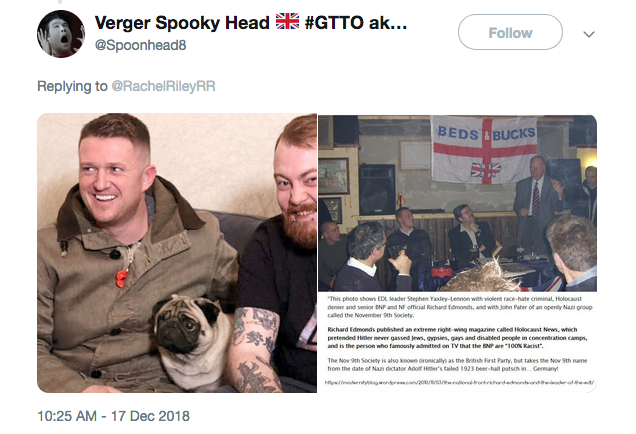 He’s a pal of Stephen Yaxley Lennon, who styles himself Tommy Robinson, whose Islamophobia is legendary. 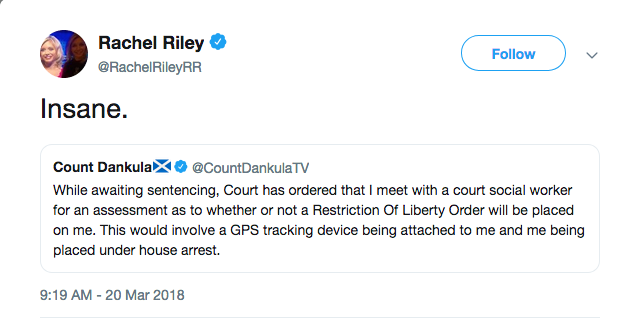 And Rachel Riley has sympathised with him. 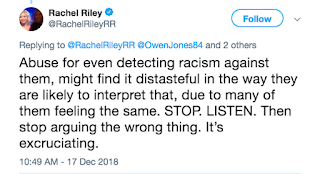 So when Ms Riley tells “On a separate note, a HUGE, MASSIVE, heartfelt thank you to each and every person calling #Antisemitism out, showing your support, challenging the ignorant or the bigoted, or even just by fact checking what you’re reading in this whole awful tale”, perhaps she has a little more of this “whole awful tale” to learn about. Anti-Semitism is out of order. But so is sympathising with its proponents. The mere notion of Sugar leaving the country is enough to get me joyfully pissed tonight. And he could take that pile of narcissistic morally corrupt cringeworthy garbage The Apprentice with him - plus the forehead knuckling participants and those who make the propagandist shite. None of them will be a loss, whether Christian, Jewish, Muslim, Budhist, Hindu or atheist. We could do with a good healthy clear out of the lot of them, preferably to somewhere in the Bering Strait. Given her job is specifically about being good with letters, you'd think she'd be more careful about stringing them together wouldn't you? 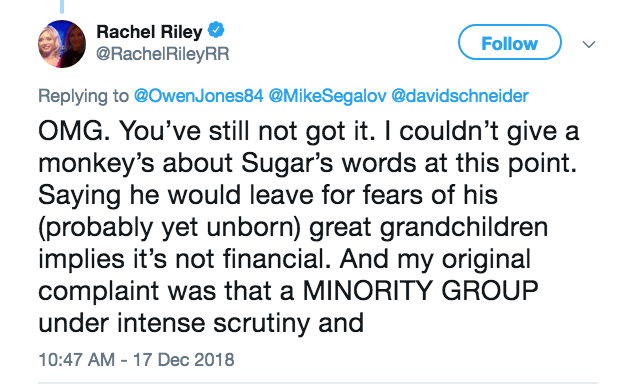 I normally like her, but she's proven to be another celeb woefully out of her depth when it comes to giving a political opinion via social media...and why even bother leaping to Sugar's defence? Well because her Countdown mate is his paid crony I guess. Ridiculous. Anon, The Apprentice really is cack isn't it? I still watch it, Christ knows why. 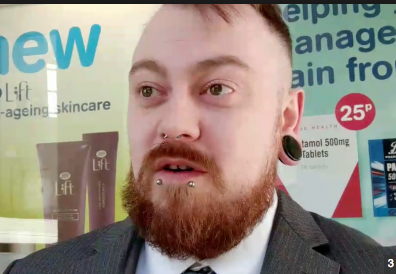 It's perversely enjoyable to watch these jumped up idiots show how little IQ they have but its ridiculous to believe they have a hope in hell in business. The show mutated into a light ent game show years back and with each series finale they bring back the same past winners, including Charlie Hanson alike inventor Tom who, in 2011, claimed he'll be bigger than Dyson and has seemed to have spent the last 7 years fannying about with nail files. The biggest, sickest joke however is this propaganda that Sugar is a businessman. How many important players could really afford to give up so much of their time to a game show each year? The fact that the show no longer employs apprentices tells you all you need to know about how little prospect Sugar's interests have now. And as for his investment, who's to say it's not just the salary he takes each year from the beeb? Whenever the winners of the dreadful show begin to work with Sugar, it always ends badly, usually a pay off in return for a gagging order. Rachel isn't the sharpest tool in the C4 toolbox, if she hasn't worked it out yet, she is the eye candy for a show that is a snooze fest and should have been axed when the original presenter died. I had a look at her twitter after reading this post yesterday, jeez it's like looking into an open sewer. It looks like she's been to Auschwitz recently and that has understandably affected her a great deal, as it would any compassionate human being. However, how she's gone from that to believing it could happen here under a Labour government is frankly ridiculous. She's been cosying up to the Baddiel whichs tells us exactly where the ideas are coming from. There's a tweet from David Baddiel saying she's a great new striker on the kick as out team...talk about trivialising an issue! What annoys me is that they attack the likes of Owen Jones for - as they chose to believe - deliberately manipulating information...something which presumably is the sole domain of theirs, given that Baddiel went on Frankie Boyle's show claiming that Corbyn supporters believe the world is influenced by a shadowy cabal of Jews - information he got from the poll ahead of the Labour leadership election, that he deliberately manipulated as the real question was is the world influenced by an establishment. The word Jew was never mentioned or indeed implied, and every other Labour candidates supporters answered the question too. Lineker Twitter Row - Where’s Brillo? IEA - Still Economically Illiterate.